PATRIARCH. Patriarch Aleksey II died on Friday and more than 80,000 people came to his lying-in-state at the Cathedral of Christ the Saviour. He presided over a spectacular rebirth of the Russian Church – when I was stationed there 1993-1996 I never saw a church that wasn’t being repaired and I saw many full. CAPITAL OUTFLOW. For what it’s worth, the Central Bank of Russia Chairman said last week that capital outflow from banks in November was much smaller than in previous months and expressed his confidence that it has stabilised. Of course, so much has left that there probably isn’t much more to go. Here are some essays on the financial crisis on Russia that people who know more about it than I do have praised. SOMETHING NEW. To me at any rate. I was reading Putin’s interview session and one of the people complained about the Unified State Examination of which I had not heard. Putin defended it as a means of reducing corruption in enrolment for higher education and said that statistical evidence showed it was working in that enrolment on the top universities from remote areas had increased by 10%. Polls on corruption regularly place the education system high (but not as high as the police). This is another example to show that developments in Russia are much more complicated than any one watcher – let alone the Kommentariat, obsessed as it is with neo-Kremlinology and stereotype – can follow. Russia is still very a very “top-down” country, but there are enough initiatives, developing and interacting with each other, to “thicken” the mix. CORRUPTION. Sergey Stepashin, the head of the Audit Chamber, has just said “Unlike previous decades, budget funds are not stolen in Russia today. We can now speak about instances of their ineffective use”. The Audit Chamber has for some years been looking at whether the money is effectively spent by the agency as opposed to being merely spent on the budget item. He may be over-sanguine but certainly we don’t have the outright disappearance of large amounts of money the way we did in the 1990s. HERE WE GO AGAIN. Once again Other Russia demanded approval to hold a demo on Tverskaya Street on 14 December and once again the Moscow authorities refused and offered an alternative location. (In St Petersburg they asked for the equivalent – Nevskiy Prospekt). This game is played constantly: Other Russia demands a venue it knows it will not get – no one gets Tverskaya which is Moscow’s main street – so that it can force a stunt that the Western media will cover. Will the Western media be suckered again? 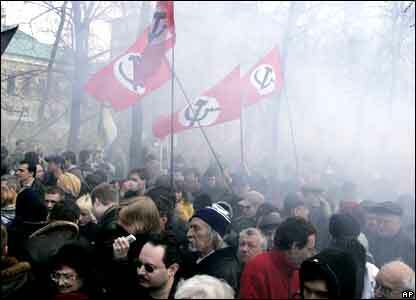 Will it report this time that the bulk of the protesters are from the rather un-democratic National Bolsheviks? MEDVEDEV’S TRAVELS. Back from his Latin American trip, Medvedev has been to India and Italy. ROMANOVS. US and Russian scientists again confirmed that the Yekaterinburg remains were those of Nikolay II and his family. The Church still holds off on agreeing – presumably because it wants to be absolutely certain. ROSES AND DANDELIONS. The Georgian opposition continues to grow: former Foreign Minister Zurabishvili’s party has called for immediate elections; two opposition parties have announced an alliance. Rumour has it that the former Ambassador to the UN is about to join the opposition. There has been another government shuffle: opposition there too? I was wrong to expect Saakashvili’s overthrow to be soon: the process is slow. While the opposition suffers from too many leaders, it is coalescing around a platform of early elections to replace Saakashvili and his parliamentary myrmidons but, given his near-total control of news outlets, it is moving slowly. It is also likely that the opposition does not want Saakashvili to be the third President in a row replaced by coup. But it’s coming: as Saakashvili’s support in the West wanes, almost all of his former allies now want him gone. Meanwhile the Georgian Patriarch attended Aleksey’s funeral and had a meeting with Medvedev; he called for better relations but did not openly criticise Saakashvili. ORANGES AND LEMONS. Ukraine has been hit hard by the financial crisis and bitter in-fighting by former political allies but a new “Orange coalition” in Parliament has just been formed. Given that Yushchenko has been virtually calling PM Tymoshenko a Kremlin stooge, I cannot think that this one will last much longer than the others. The NATO question just intensifies east-west strains. Meanwhile it has to pay its gas bills; although the IMF, which has granted a loan, believes there is enough money on hand to do so, Ukraine is currently a couple of months behind. Yushchenko has promised that it will not siphon off Europe-bound gas, as it did in 2006 when Gazprom cut supply because of unpaid bills (Moscow was blamed of course).